Krotos Audio, the company behind the innovative Dehumaniser and Reformer product range, are pleased to announce the release of their latest product - Weaponiser. Weaponiser is the only all-in-one solution for weapon sound design; providing a powerful and efficient workflow, a comprehensive library of professionally recorded weapons, carefully designed presets with high-end, real-time synthesis and unparalleled sound quality - making it the ultimate ‘go to’ tool-kit for creating dynamic assets. Weaponiser gets you started with an introductory library of professionally recorded weapons, carefully designed presets with high-end, real-time synthesis and unparalleled sound quality – making it the ultimate ‘go to’ tool-kit for creating dynamic assets. Weaponiser Basic offers a total of 952 assets, 515 edited Weapon recordings, 4 weapons, 398 Sweeteners and 39 IRs and 70 presets, and also contains a collection of UI sounds, voices and drum sounds for beatmakers. • Comprehensive library of professionally recorded real-world Shotguns, Rifles, Machine Guns, Assault rifles, Pistols and weapon Foley. Combine with Sweeteners and IRs, easily accessible via our tag-driven browser via simple drag and drop and available in a variety of different mic positioning’s. • Huge range of designed presets for all weapons types, sci-Fi, bullet effects, drums and UI. • Customized engines to design constituent elements and layers of shots with ease - Onset, Body, Thump and Tail. • Edit and randomize Envelope or Knob Speed and Level for each bank, activate the Synth button to synthesize and process with FM or AM synthesis, choose from a selection of Carriers and Modulators, Pitch, Duration, Gain and edit Amplitude and Amount Envelopes. • Use MIDI to trigger your engines and velocity sensitivity to program or perform precise variations. • Utilise our FX panel and use EQ, Compression, Limiting, Saturation, Ring Modulation, Flanging, Transient Shaping and Noise Gating to amp-up your weapons for that hyper-real sound: Subtly tweak or totally destroy! Chain your FX to effortlessly build up complex signal flows. • Sequence or offset your sounds to a built-in timeline, allowing for more precise micro-timings between engines. • Hit the Fire button to audition, activate Burst mode to create automatic weapons from single shot assets, adjust the Fire Rate for creating different loop speeds or press the Drunk button to randomize your timeline sequences, making each shot sound subtly different. 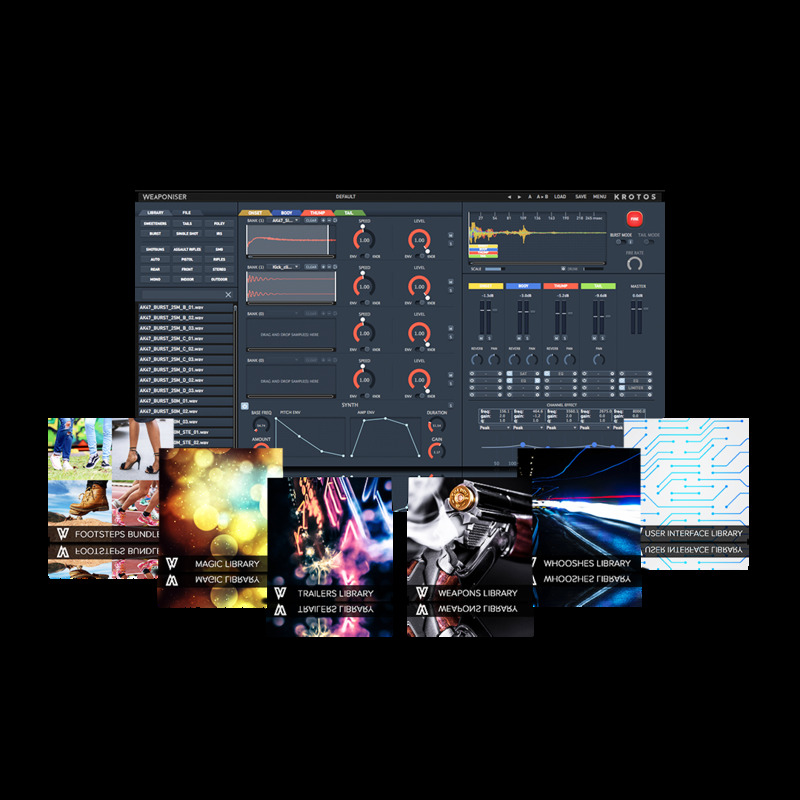 • Easily combine Weaponiser with your existing workflow, or process individual engine outputs and your favourite plugins with ease. 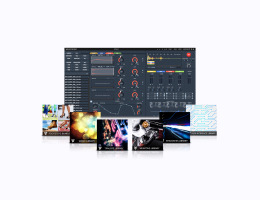 • Break out your weapon elements onto a mixer for intuitive tweaking and dynamic mixing, and quickly render layers for easy export to in-game engines or your DAW.